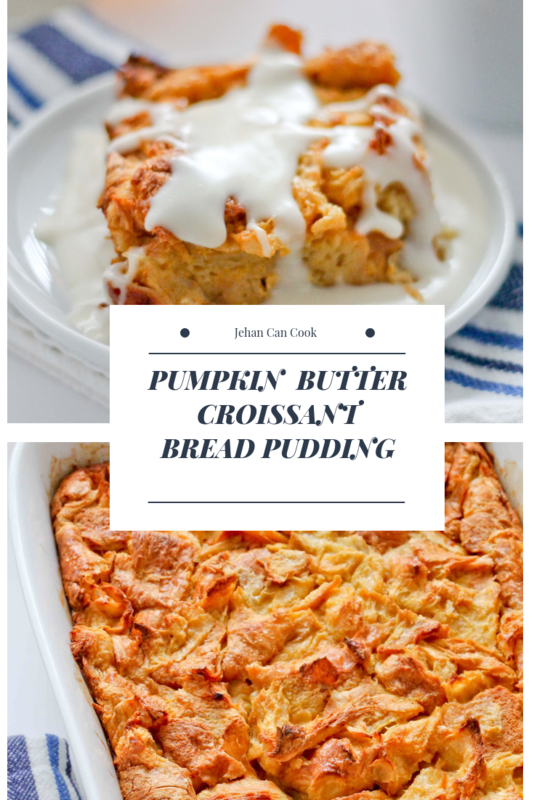 All throughout the month of November, I will be sharing holiday recipes that are perfect for the upcoming Thanksgiving! I’ve share a brined Roasted Chicken and Grapes earlier this week, so be sure to check it out if you’ve missed it. Today I’m sharing a simple but decadent dessert that’s so easy even a novice baker can do it and it can be made ahead of time. Every Thanksgiving there are certain items I must have and a pumpkin dessert is one of them. I used to make pumpkin pie every year but soon became tired of it so I started making pumpkin desserts instead. I’ve made pumpkin cheesecakes, pumpkin gooey butter cake, and pumpkin streusel pie just to name a few. 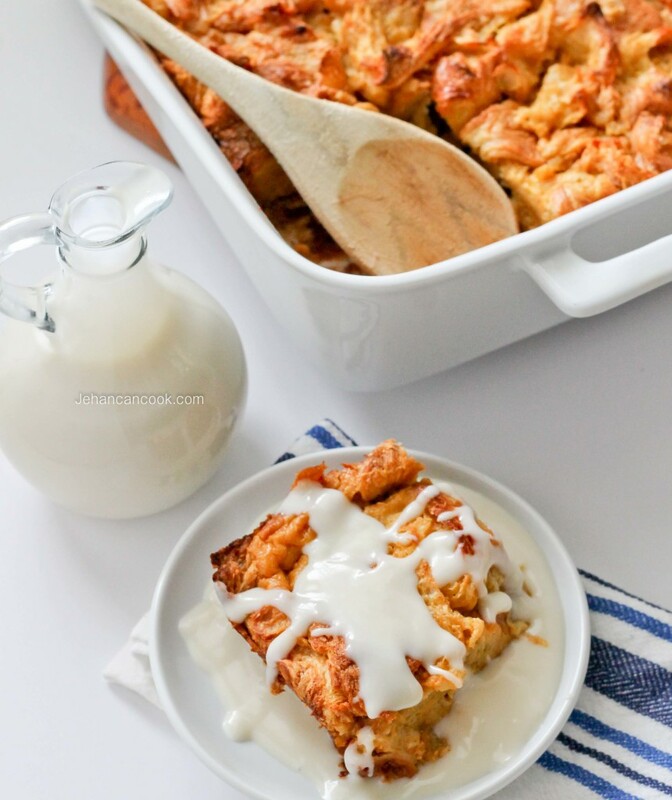 One of my favorite pumpkin desserts is a pumpkin bread pudding. This year I’ve kicked it up a notch by using pumpkin butter, buttery croissants, Four Roses Bourbon and topping it with a bourbon sauce. It is everything a holiday dessert should be and more; delicious, decadent and EASY! 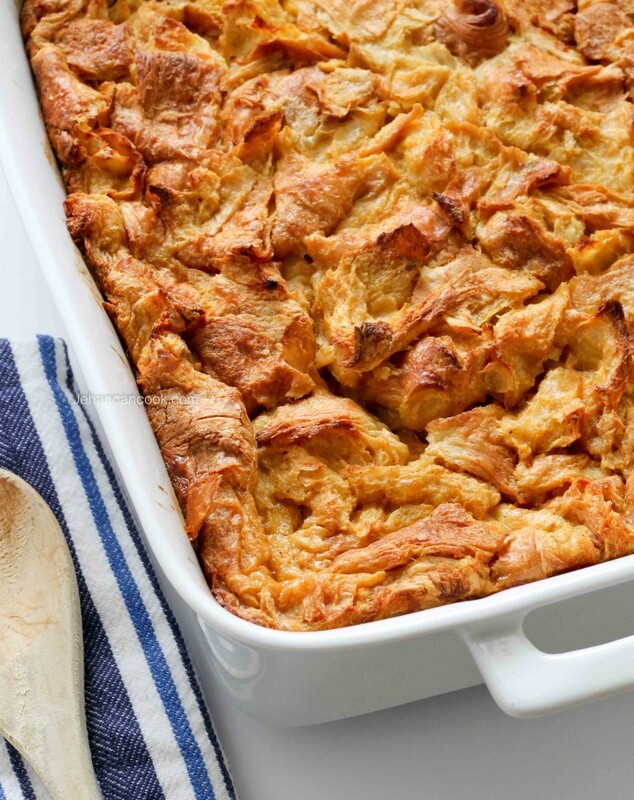 To make the Bread Pudding: Preheat oven to 350 degrees. Tear croissants into small pieces, about 2 inches then place in a greased 13×9 baking dish. Add eggs, sugar, vanilla and pumpkin butter in a medium size bowl and whisk to combine. 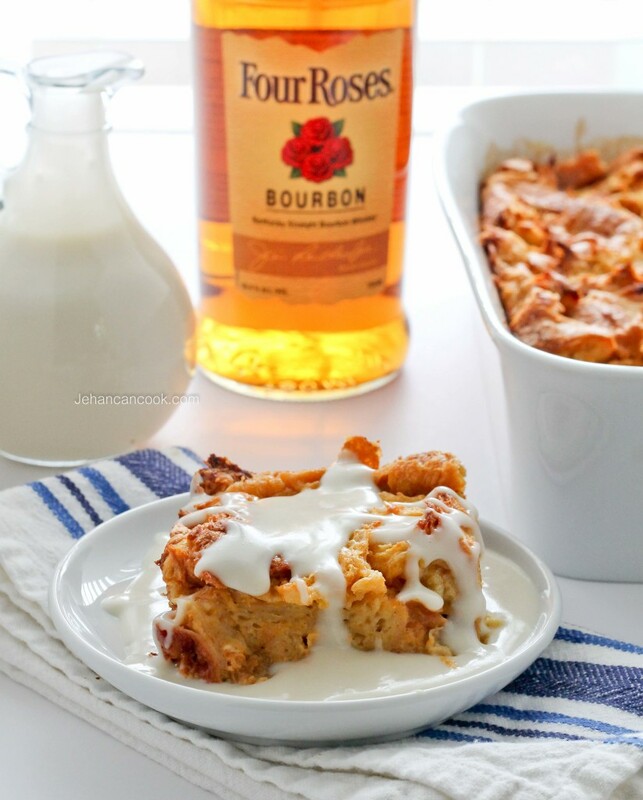 Add milk, cream and bourbon and mix to combine. Pour over croissants then press the croissant down, then let it sit for 15 minutes to allow the croissants to soak up the liquid. Place into preheated oven and bake for 50 minutes to 1 hour. Remove from oven and allow it to cool. Serve warm or cold with warm Bourbon Sauce. To make Bourbon Sauce: Melt 2 tablespoons butter in a saucepan over medium heat. Remove from heat then add flour and stir to combine. Slowly whisk in milk and sugar. Add the milk slowly or else the mixture will become lumpy. Place on the stove over medium heat and stir until the sauce boils and thickens; reduce heat and simmer for 10 minutes, stirring occasionally. Remove from the heat then add 1 tablespoon butter, cream and bourbon. Cover with cling wrap. Press the cling wrap down onto the top of the sauce so it doesn’t form a skin. Serve warm. 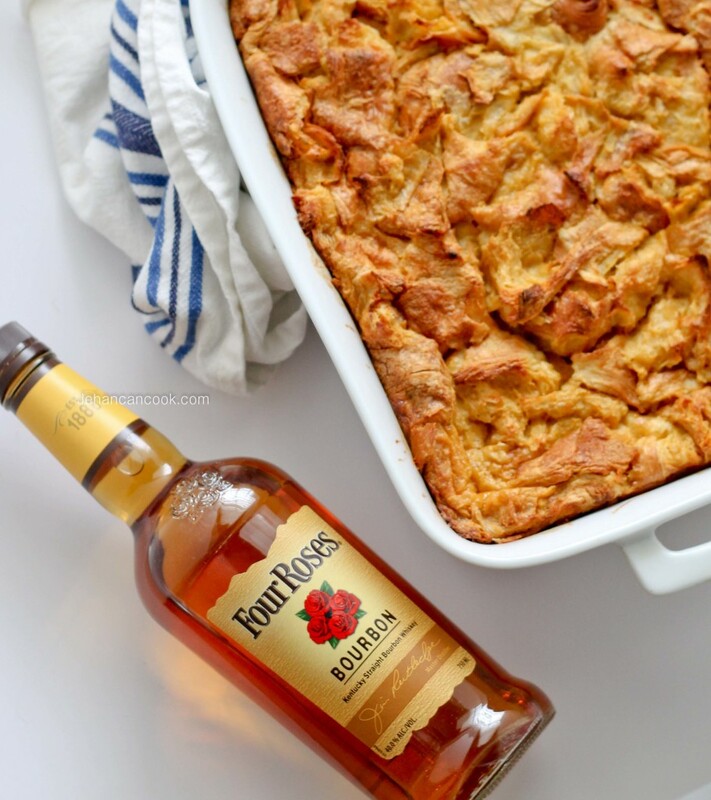 As a member of Atlanta Food Bloggers Society, I received Four Roses Bourbon as a gift but all opinions are mine.